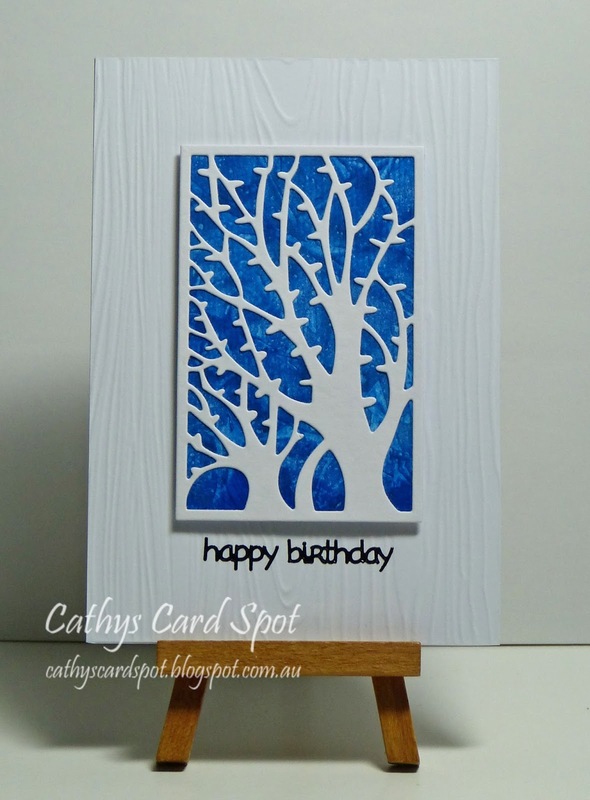 Cathy's Card Spot: More acrylic paint with cling wrap. More acrylic paint with cling wrap. Hi everyone, I had some acrylic paint and cling wrap backgrounds in my project box and thought I'd make some quick cards. April is another busy month for birthdays here! The tree die was a gift so I'm not sure of the brand and the woodgrain base is done with a Papertrey Ink coverplate. I've popped the tree panel up on some fun foam for dimension. A sentiment sticker finishes it off. I'm linking up to the birthday challenge at Simon Says Stamp Wednesday. They are celebrating theiir 9th birthday, Congratulations! At Addicted to Stamps & More the theme is anything goes! At Seize the Birthday, I've gone with the anything goes birthday option. Oh dear, now I have to try this cling wrap with paint! The techniques never end! This made a fantastic background with texture you can really see. The tree looks great over it. Love your textured background and also the acrylic painted cling wrap one - so bold! The tree die is just perfect. Fablulous card Cathy. stunning blue and so lovely and textured. Great masculine or Teen card. I have not tried this cling wrap technique but with this beautiful background I just have to give it a go sometime soon. Fabulous card! Thanks for being in our gallery at Seize the Birthday! Slow and steady, snail's pace. Colourful alcohol inks & gilding flakes.